First I did install BlackBerry Tablet SDK in D:\Program Files\Research In Motion\blackberry-tablet-sdk-2.0.0\ folder. From PuTTY web page I downloaded putty-0.62-installer.exe in D:\Program Files\PuTTY\ folder. 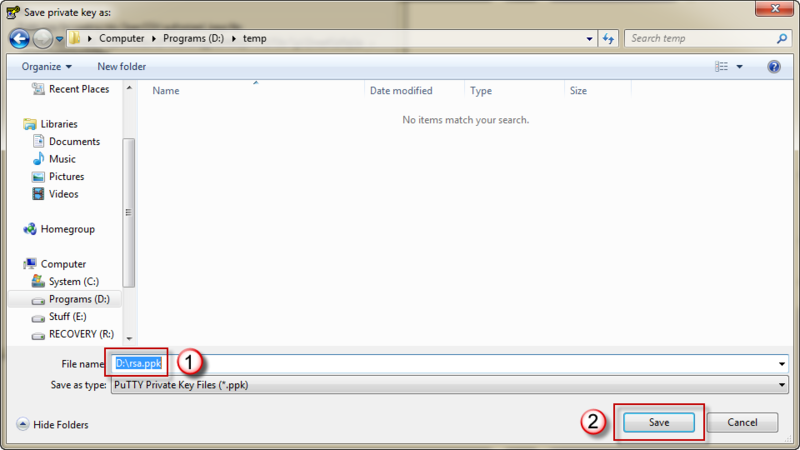 After that start Notepad and paste public key copied from PuTTYgen application. Once key is in Notepad save it. 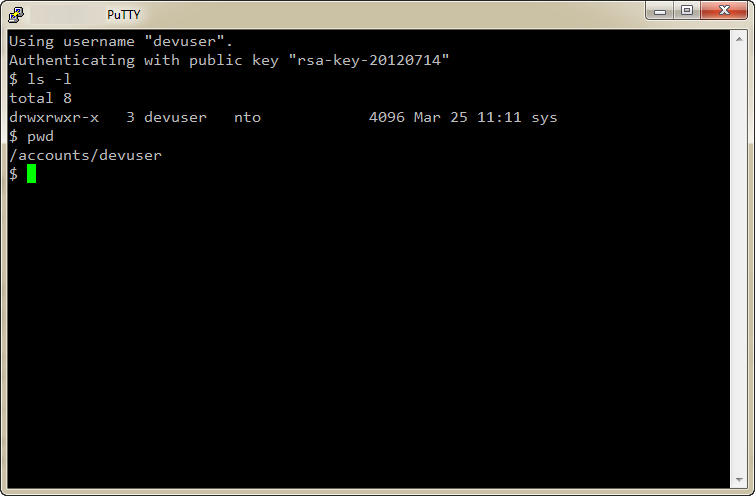 In this example I saved public key in D:\rsa.pub file. After public key is saved go back to PuTTYgen application and click Save private key. PuTTYgen will ask if you want to save key without passphrase. Click Yes and choose location and file name for private key file. 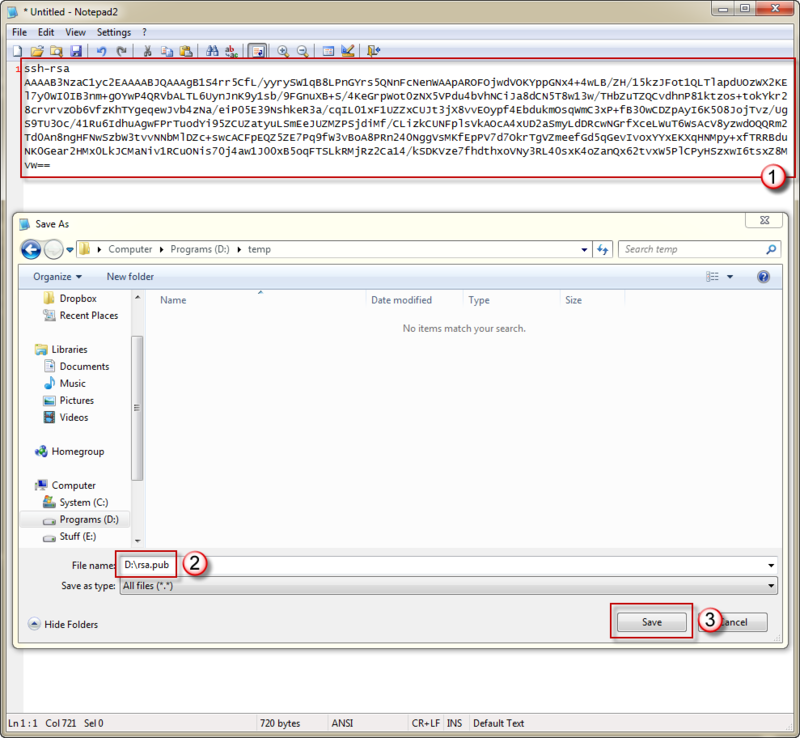 In this example I saved private key in D:\rsa.ppk file. Once private and public keys are saved start Command Prompt. In Command Prompt window go to D:\Program Files\Research In Motion\blackberry-tablet-sdk-2.0.0\bin. IP address and password should be modified accordingly to your configuration. IP address is the address of PlayBook and password is protection password to access PlayBook (if it is set on your device). Also, please remember to turn on Debug Mode on PlayBook. If different version of BlackBerry SDK has been installed folder might be slightly different. Please be aware of that and modify path accordingly to your installation. Now it’s time to connect to PlayBook using SSH. In order to do that start PuTTY. On first screen enter IP address of your PlayBook. Then go to Connection\Data in PuTTY configuration tree and type username devuser (as on screenshot below). Last step is to point PuTTY client to private key file, which will be used for authentication when accessing PlayBook via SSH. Go to Connection\SSH\Auth section in PuTTY configuration tree and point to private key file in Private key file for authentication field. In my case it will be D:\rsa.ppk as I saved private key generated by PuTTYgen in that file. Now just click Open in PuTTY and few seconds later you have terminal access to your PlayBook. How to use ssh command to do ssh connection? I try to use as follow commands, but the result isn’t same. please correct me if they are not equivalent. That should be exactly the same. Make sure you have rsa.ppk in the current folder when running ssh. is it possible to gain root permssion in emulator? I am trying to run QNX app in playbook device. since it is much easier. I’m stuck on the step where you “blackberry-connect.bat…” I followed the previous steps. I couldn’t find the SDK from your link, so I used this instead (http://developer.blackberry.com/playbook/native/download/). However, when I try to connect to my Playbook it says “Error: Connection failed: connect timed out”. Do you know what could be the problem?